The results, published in the British Journal of Psychiatry today, estimate the overall rate of probable PTSD among current and ex-serving military personnel to be 6 percent in 2014/16, compared to 4 percent in 2004/6. The study also found the rate of alcohol misuse has fallen from 15 percent in 2004/6 to 10 percent in 2014/16. The increase in rates of probable PTSD is primarily seen among ex-serving personnel who deployed to Iraq and Afghanistan. Among those who deployed to the conflicts, the rate of probable PTSD for veterans was 9 percent compared to 5 percent for veterans who did not deploy. The rate of probable PTSD among currently serving personnel was also 5 percent, which is close to the rate of PTSD in the general population. 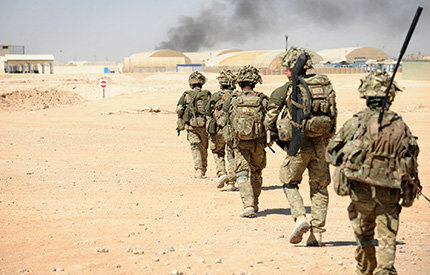 Among ex-serving personnel who deployed in a combat role to Iraq or Afghanistan, 17 percent reported symptoms suggesting probable PTSD compared to 6 percent of those deployed in a support role such as medical, logistics, signals and aircrew. The findings are from the third phase of a major cohort study by the King’s Centre for Military Health Research, which has been running since 2003 and is funded by the Ministry of Defence. Of 8093 participants included in the third phase of the study, 62 percent had deployed to Iraq or Afghanistan. The study also found that the rate of common mental disorders was raised for veterans who held a combat role, at 31 percent compared to the overall rate of 22 percent. However, the overall rate of common mental disorders had not increased compared to previous phases of the study. PTSD remains less common in the military than either alcohol misuse or common mental disorders.